Tim Mason - Subacoustech, Ltd.
Block Island Wind Farm, a 30MW farm with 5 turbines situated off the coast of Rhode Island, is the first offshore wind farm in the United States. This construction and initial operation brings the opportunity to understand the environmental effects of offshore wind development through environmental monitoring. This particular study focuses on the environmental impacts of acoustics on marine animals during construction and operation, as a component of a host of studies led by the Bureau of Ocean Energy Management (BOEM) to better understand offshore wind development. Specifically, this study provides site-specific monitoring that builds on international understanding of environmental effects. 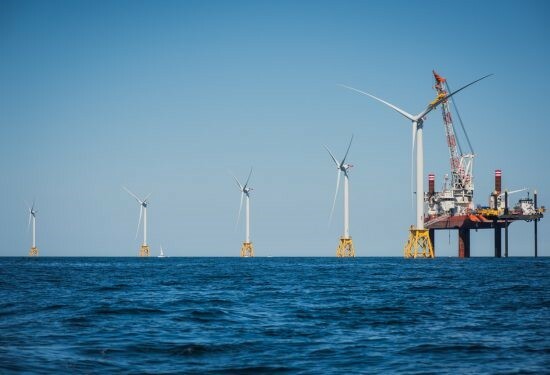 Additional offshore wind farms are expected near the Block Island Wind Farm on the Atlantic Coast as BOEM has leased over 1.2 million acres for future development, making it increasingly important to understand the effects of development on the marine ecosystem. Construction on Block Island Wind Farm started in July 2015. The five turbines are located just inside state waters at a depth of about 30m and are connected to the National Grid via a substation on Block Island and to the mainland via a second transmission line. The structures consist of jacket type foundations with piles driven at an angle of 13.27⁰ to the vertical, to pin the structure to the seabed. When construction began, a barge was initially used for pile driving operations which generated intense sound, impulsive in nature at close range, which radiated into surrounding air, water, and sediment. This excess noise encouraged the construction crew to switch to using a jack up rig that greatly decreased the emitted sound. This style of pile driving had never before been assessed, although vertical pile driving had previously been modeled by Reinhall and Dhal (2011). Reinhall and Dahl (2011) showed that there is a strong contrast in compressional wave velocity with vertical pile driving. To monitor noise of construction, a number of instruments were deployed at several locations between 500m (due to construction restrictions measurements could not be taken closer than 500m) to 15km out from the pile driving location. These instruments included a geophysical sled with a tetrahedron of hydrophones and a 3-axis geophone (500m out); a dipped hydrophone particle velocity sensor (500-750m out) to assess particle velocity; a towed array of hydrophones (750+m out); and vertical arrays of hydrophones (7.5km and 15km out) to assess propagation of sound away from the site. Installation monitoring occurred between August and October 2015, measuring data between two of the five turbine. The towed hydrophone array consisted of eight elements including a Woods Hole Oceanographic Institution depth sensor to measure the array depth and was used to collect data over two days, producing a 64kHz/channel digitized dataset. The data were monitored in real-time using Raven 1.5 and stored in 30-second files for post-processing onshore. The data revealed strong acoustic pulses that correlated with the timing of pile driving strikes every few seconds and peak-to-peak sound pressure levels of 180-190dB at 1000m out. Additionally, there was variation between the two days of collection with the second day capturing full frequency range and data that went beyond 190dB (the sensors were saturated past 190dB so the equipment could not capture this fully), potentially due to the angle of pile driving relative to the sensors. The geophysical sled was equipped with the four-hydrophone tetrahedral array for measuring acoustic particle velocity for fish studies, and the 3D geophone with low sensitivity hydrophone for measuring sediment motion. The sled was deployed for six days, at times under tow and sometimes stationary on the seabed, collecting data approximately 500m out from the turbines. These instruments captured peak-to-peak broadband sound pressure levels of 194dB, which allowed for the estimation that the source level was likely 248dB right next to the pile, assuming spherical spreading. Most of the pile driving signal energy was below 4000 Hz but some signals were detectable above 10 kHz. 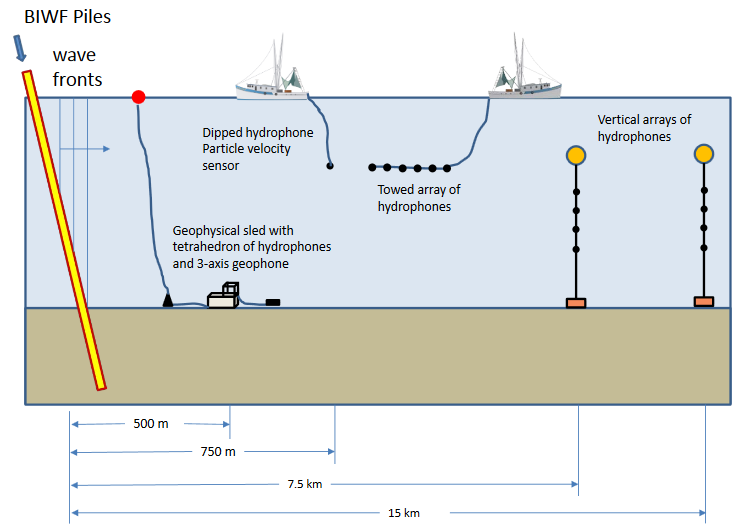 The vertical array of hydrophones, or Several Hydrophone Receiver Unit (SHRU) Mooring, was used for standard passive monitoring and was originally deployed at 7.5km from the source, with an additional SHRU Mooring at 15km added during the second deployment. Post-construction monitoring occurred December 2016 to January 2017, measuring operational acoustic data at turbine site 5. The tetrahedral hydrophone array and geophone array were 50m from the source, with two vertical SHRU Mooring arrays 100m and 7.5km out. Measurements taken showed turbine noise focused at about 70Hz. The RMS sound pressure level for this signal was 100 dB re 1 µPa. In addition, the monitoring instruments also captured a 20Hz signal from a vocalizing fin whale in the study area. Overall, the equipment performed well and collected data successfully. The study showed that using a combination of fixed and mobile sensors was successful, provided sufficient data for 3D modelling, and explained certain aspects of sound propagation. Additionally, setting multiple hydrophones to different gains and deploying sensors at differing locations and ranges made it possible to reconstruct the sound propagation profile. In order to improve future studies, it is suggested that additional measurements be taken closer to the piles (potentially deploying sensors close to the piles throughout construction), taking additional measurements at 7.5 and 15km from the source, and taking additional particle velocity measurements at mid-water depths. For future studies, researchers also suggested that temperature and salinity data be collected using the vertical hydrophone array moorings in order to increase information gathered. Currently, 3D modelling is underway in cooperation with Sandia National Laboratories. In the future this study will acquire additional measurements, fully analyze data collected at all locations during pile driving events, and compute particle velocity for fish studies. Based on detection of a fin whale during monitoring, researchers see the need to install permanent passive acoustic monitoring equipment in the study area. The study concept, oversight, and funding were provided by the U.S. Department of the Interior, Bureau of Ocean Energy Management, Environmental Studies Program, Washington, DC under Contract Number M15PC00002_M16PD00025.